Detoxification is how your body gets rid of waste. It’s a natural process that your body does on a daily basis to neutralize, transform and get rid of unwanted toxins. If waste builds up, we get sick. According to the nonprofit organization Environmental Working Group, the average newborn baby has 287 known toxins in his or her umbilical cord blood at birth. This means the mother is exposed to at least this many toxins on a daily basis. The topic of this article is about how to improve and optimize the function of your body’s own detoxification systems. 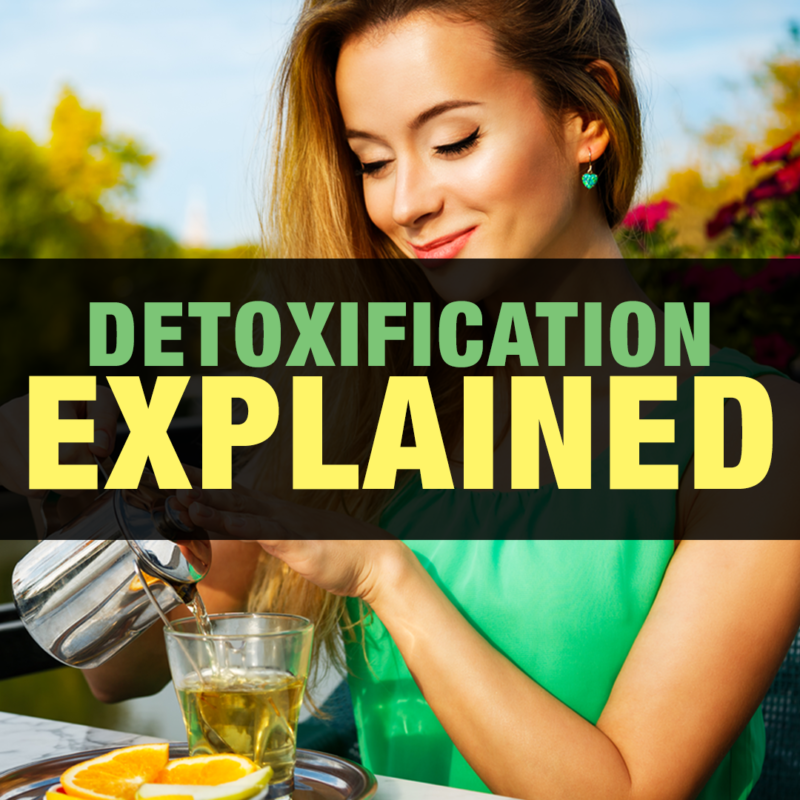 This is done by decreasing the amount of toxins we put into our bodies while at the same time supporting our body’s detoxification and elimination systems with key nutrients and supplements. As a culture we are very cognizant of our body’s external cleanliness. We clean our teeth daily, wash our hair regularly and like to smell and feel clean. Similarly, detoxification is internal cleansing. The problem with internal cleansing is that it’s impossible to know when our internal cleansing mechanisms are not functioning optimally. For example, you can’t externally see how well your liver is working. When our organs are overtaxed and overburdened with toxins, symptoms can creep up such as fatigue, digestion problems, bloating, and muscle aches. When these symptoms go unchecked and our bodies are not able to detox optimally, we are at risk for greater health problems down the road. How do our bodies detoxify themselves? Our liver, kidneys, cardiovascular system, and skin work hard every day to process all of the substances that come into the body and to expel toxins. Although the bulk of the work is done by the liver and the kidneys, the intestinal tract, the lungs, and your skin are all involved in this complex detoxification system. The liver – The liver filters the blood coming in from the digestive tract before it passes on to the rest of the body. The liver detoxifies chemicals, metabolizes drugs, creates bile and makes proteins important for blood clotting. The kidneys – The main function of the kidneys is to remove waste products from the body and to regulate electrolyte and fluid levels. Every day, the two kidneys filter roughly 150 liters of blood and produce 1 to 2 liters of urine. The kidneys also regulate blood pressure which is a major component of cardiovascular health. Traditional Chinese Medicine and Ayurvedic Medicine have used detoxification and purification techniques for centuries– healing foods, herbs, and habitual fasting. Fermented foods such as sauerkraut, kimchi and kombucha. Certain strains of beneficial bacteria (like Lactobacillus) have the ability to bind and detoxify heavy metals that accumulate in the body. Research shows that strains in fermented kimchi can break down and degrade pesticides commonly used on crops. Beets and milk thistle both help to keep the liver healthy so that it can do its job to remove toxins from the blood. Choosing organic food helps to avoid organophosphate pesticides and other other hazardous chemicals. Drinking plenty of filtered water every day (not from plastic bottles!) helps your body eliminate toxins by keeping your kidneys and bowels active. Avoid things that are known to tax the liver such as toxic vegetable cooking oils (soybean, corn, canola) and sugar. Chelating agents like fulvic acid – Fulvic acid bond with heavy metals, enabling your body to excrete them. One of the problems with processed foods and even healthy unprocessed foods like fish is that they contain heavy metals. Detoxification teas – Detoxification teas support the natural detoxification process with their diuretic effects and promotion of elimination. Chronic stress, poor diets, aging, increased exposure to toxins and refined foods all take their toll on your liver and kidneys. They need some support. Whole food probiotic supplements – It is very difficult to get enough beneficial probiotics through diet alone. A good quality whole food probiotic supplement is a convenient and cost effective way to supplement with the beneficial bacteria your body needs to function at its best. In addition to the above food and supplement recommendations, habitual intermittent fasting and saunas are other great tools to help the body optimize its own detoxification processes. This entry was posted in Detoxification and tagged detoxification, fulvic acid, probiotic, teas, Whole food.